– Walmart, the largest retailer, was missing 41% of all customer service enquiries. Costco, Kmart and Kroger missed 100%. Safeway were doing relatively well, missing only 5%. Overall, 65% of all complaints and questions were missed by the sample group. – Safeway was given praise for dealing with the full complaint on the wall. 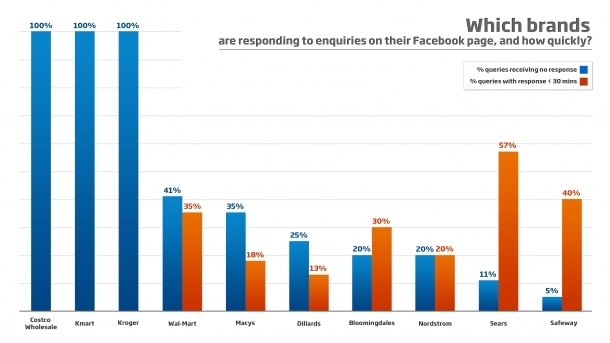 Safeway redirected some complaints to a Facebook dedicated email and a Freephone number, but a significant number of conversations about customer satisfaction are handled on social media outlets which means the solutions are visible to everyone. – US retailers are generally slower at responding to customers than UK retailers. None of the ten in the US study were averaging at under an hour, compared with two retailers in the UK sample achieving a quick average time. Read the full report below, it is worth the time.